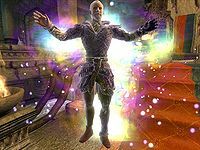 "He is risen from the depths of madness"
My Real Name is Lewis, but since Sheogorath invited me to his realm my mind went mad hence Manic is born. I have Morowind, Oblivion and Skyrim. As far as UESPWiki goes, I have made over 1000 edits and am ranked 58th on the Active Users Page. I am currently the sole person working on redesigning the Mages Guild by adding relevant dialogue and quest information. I have completely redone Hannibal Traven's page as my biggest achievement. I have been a Userspace Patroller for over three months and look to further progress. If you need me, feel free to message me on my talk page. My page contains alot of random content, however below in my sandboxes is where I am currently working. Feel free to browse them and if you have any new information please post it on the talk page. Please do not edit the pages themselves as they are references that I am currently working on. Thank you. I am the founder of the newly formed GamesRacedAwfully (GRA). GRA is a small niche community of gamers who race games (often terribly) against each other for friendly competition and for fun. Races usually consist of 4-6 participants and are recorded and uploaded to Youtube. Check out our youtube channel, GamesRacedAwfully, if you're interested and see our first uploaded race of Crash Bandicoot, with Spyro and Wolfenstein 3D soon to follow. Check all Chorrol Citizens: On going - Primary goal, while my time is limited. This user has improved and is still improving the Mages Guild Pages. I am currently involved in OBNPCRP Project. Arch-Mage Hannibal Traven: From this to this. Raminus Polus: From this to this. Climb the Steps: From this to this. You can add this userbox to your page if you are listed above. This user has been inducted into Manic's Hall of Fame. Greetings: Welcome straight to spot to the crazy and queer Cicero for his amusing dance. Farewell: Jalbert failed to retain his place, due to his lack of charisma. Mourning the death of Kodlak. Setting up TNTs under The College of Winterhold bridge, and staring in disgust. Again. Locating lit torches... in underwater chests? This user has been on UESPWiki for 8 years, 10 months, and 30 days. This user is suffering from Felldew withdrawal. This user is ranked 51st on the ActiveUsers page. This user lost his mind to the Madgod. This user likes Chuck Norris in Oblivion. This user reached his one hundreth hour of Oblivion Play on 5th March 2011. 4910 This user scored 4910 on the UESPAHOLIC Test. This user has made over 1,500 edits to UESP. ManicX This user is the Founder of ActingWikia. This page was last modified on 15 October 2018, at 16:20.